On-site Receptions are available at Tarpy’s Restaurant, located on the same premises as The Monterey Stone Chapel. With a full bar and an award winning wine list your reception or rehearsal dinner is sure to be a unique and memorable experience. Relax in this 1917 Roadhouse and enjoy creative, Five Star American Country Cuisine. The wood-burning grill provides wonderful flavors for wild game, the freshest seafood and prime steaks. Set on five landscaped acres, the patios and extensive gardens provide a refreshing backdrop for hearty sandwiches, vegetarian entrees and tempting salads. 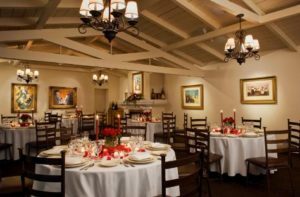 Seven private and semi-private rooms are available for banquets, meetings and celebrations. The full bar, award-winning wine list and knowledgeable professional service ensure a terrific dining experience. Reservations are recommended. Tarpy’s also offers affordable full-service, off-site catering. Please call a banquet specialist for wedding reception assistance at 831-655-2999. For restaurant reservations call 831-647-1444.